LinkedIn is the preeminent business social network and a place where most business professionals already have a presence. The key is making your LinkedIn presence work for your business! Neal Schaffer is a Forbes Top 50 Social Media Power Influencer two years in a row and creator of the AdAge Top 100 Global Marketing Blog Windmill Networking (recently rebranded as Maximize Social Business), Neal is a global social media speaker who also teaches as part of the Rutgers University Mini Social Media MBA Program. 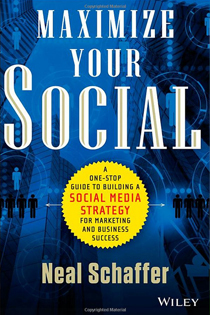 As an author, Neal is best known for his definitive book on social media strategy creation, implementation, and optimization “Maximize Your Social: A One-Stop Guide to Building a Social Media Strategy for Marketing and Business Success” (Wiley). Maximizing LinkedIn for Sales and Social Media Marketing and Windmill Networking: Maximizing LinkedIn. 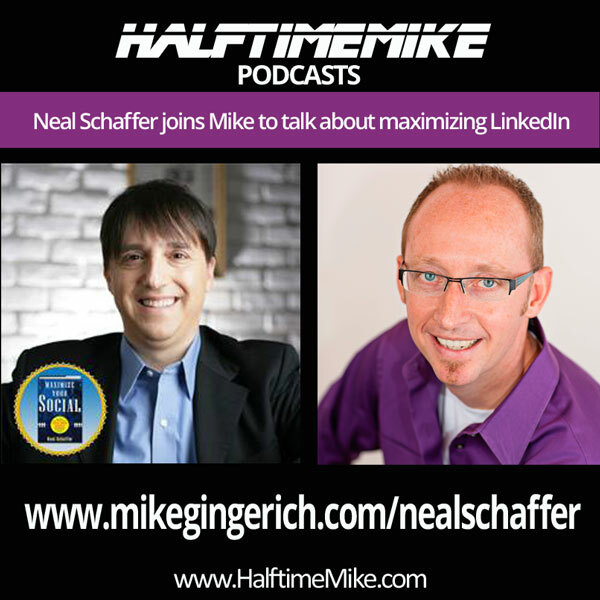 I was privileged to meetup with Neal recently at the New Media Expo (#NMX) conference in Las Vegas where we sat down and recorded a concise interview on maximizing your LinkedIn presence. via iTunes: Halftime Mike on iTunes | Android users via RSS | Listen on Stitcher. Be intentional about your headline. Your name, photo, and headline are your “brand” presentation on LinkedIn! Differentiate yourself in your summary from others, showcase your uniqueness. It’s just like Facebook, how you present yourself matters. People do business with people, so present your best personal points forward. However, it’s different from Facebook. People search for business needs! Connect with everyone you know! This helps expand your audience and in particular your “visibility”, because when you post an update on LinkedIn your entire network has the opportunity to potentially see that update. This means that the more connections you have, the more visibility of what you are doing is available to a larger audience. Try to be active each day on LinkedIn by sharing some nugget as an update that can be of value to your network. Some social media tools like Buffer, allow you to schedule a post to your LinkedIn profile ahead of time for example. The key is to offer real value from your expertise and experience. Do not sell, simply offer value. Whenever possible personalize your invitation to connect on LinkedIn. LinkedIn has some automatic methods to help you increase your connections including “People you may know” that invites you to push a button. When this is done, there is no chance to personalize the invite. So, if you don’t know the person well, it is more important to be able to customize the invite. Search for them on LinkedIn and then use the ability to personalize a message instead. If you enjoyed this episode of the Social Media Marketing podcast, please go over to iTunes, leave a rating, write a review and subscribe. NEW! Neal was invited by LinkedIn to contribute to a new eBook “Sophisticated Marketer’s Guide to LinkedIn”. Create and maintain a successful social media strategy for your business!